Do you ever have those days when you’re just feeling kind of lame and down in the dumps? Thursday was one of those days for me. So I baked. The whole baking process is nice during those times. Going to the store and buying the ingredients, the satisfaction of checking items off of the grocery list, getting home and preparing it all. It keeps me busy and happy instead of lame and dumpy. 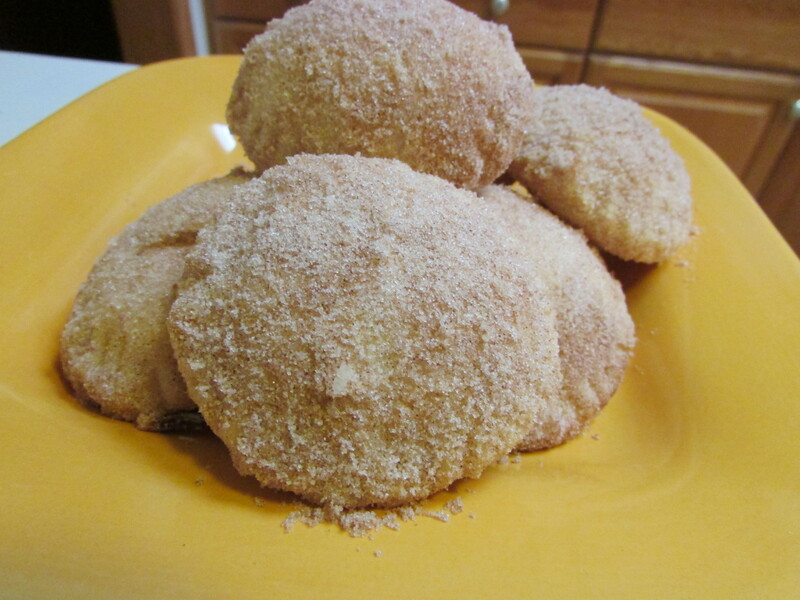 I found this really simple recipe for Churro Cookies via Pillsbury’s facebook page. Pillsbury posts so much good stuff! Linking to all kinds of cooking and baking blogs. These Churro Pocket Cookies are buttery, flaky, sweet, and delicious. And they’re super quick and easy! I call them pocket cookies because, well… they’re like little pockets when you bite into them. Yield: Approx 13 cookies, not including baked scraps. In a bowl , combine cream cheese, vanilla, and 1/4 cup sugar. Mix well. Unroll pie crusts on a lightly floured surface. Cover one of them with the cream cheese mixture. Try to create a somewhat even layer. Place second pie crust on top. Using a cookie cutter (or a cup, like I did) cut out cookies. Use a fork to press and seal the edges of each cookie. Place on baking sheet lined with parchment paper. Bake for 12-14 minutes or until lightly golden. Mix remaining 1/2 cup sugar and 2 Tbsp cinnamon to make Cinnamon Sugar. Let cookies cool and brush both sides with melted butter. If you don’t have a pastry brush for this, you can try dipping or using your hands or a paper towel. See what works best for you. Once buttered, coat well with Cinnamon Sugar. And then try not to inhale the entire platter of cookies you just made.